(Editor's Note: This article came as a solicitation. Links to the donation site have been removed in the interest of impartiality - SB). Many Americans believe that the top 1% is responsible for the rising tide of inequality in America, which is swamping and drowning the other 99%. Professor Emmanuel Saez of the University of California at Berkeley says that they are wrong. The top 1% is not the problem, he says. The top 0.1% is the problem. In a report that he issued in March (summary here), Prof. Saez examined wealth and income in America during the past century. He found that wealth inequality is back to where it was in the 1920's, just before the Great Depression. And since this trend started in 1977, the only group that has taken a rising share of national wealth is not the top 1%, but rather the top 0.1%. The 15,000 richest Americans. In 1960, the top 0.1% had less than 8 percent of our national wealth. Now it's 22%, and rising. Those who have a net worth of $20 million or more now own almost a quarter of everything that one can own in America. Folks who are in the bottom half of that one percent, the mere multi-millionaires ($4 million and up), actually have seen their share of wealth decline. A little higher, between the top 0.1% and the top 0.5%, the share of wealth has been flat. The share of the top 0.1%, though, has more than doubled. And the share of the super-super-super rich, the top 0.01%, has more than quadrupled, from 2% in 1977 to over 11% today. As for the Forbes 400, their share of national wealth has risen from 1% in 1983, when Forbes started the list, to over 3% last year. If that percentage keeps tripling every thirty years, then a century from now, in the year 2114, 400 Americans will own everything. Which stinks. Unless you are one of those 400, I guess. And what about just plain folks? How have they been doing? For the bottom 90%, since the late 1980s, the value of home equity has crashed. The value of small businesses has crashed. The value of liquid assets -- cash, stocks and bonds minus auto and credit card debt -- has been wiped out entirely. The only form of middle class wealth that has sustained itself is pensions/401(k)'s, and more than a quarter of all American workers don't have one. In a vain effort to pay all those credit card bills, the bottom 90% in America had to spend more than they earned during every single year from 1997 to 2008, until the credit wipeout during the Great Recession made that impossible. And as a result, their share of national wealth has dropped from over 35% to barely 25%. And the bottom 50%? They have a net worth of zero. Zilch. Since America seems to have forgotten about the principle of progressive taxation, the rich now enjoy a return of 6% on their investments, after taxes. 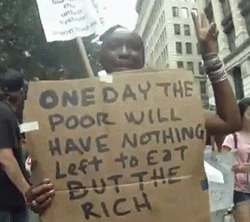 That means that anyone who works for a living has to get a 6% wage increase each year, just to stay even with the rich. Good luck with that, buddy. In America, in sum, the rich get richer, and the poor get poorer. And during my entire adult life, all that our political system has ever done has been to grease the skids. As we hurtle down, down, down toward an America -- if you can call it that -- where a tiny group of people own everything, and everyone else is a slave to wages and debt. Middle-Class America, we bid you adieu. Farewell. So long. Good-bye. Cheerio, and pip-pip. Hasta la vista, ciao, and have a great day.